That drop Tuesday was triggered by disappointment in the government's plans to overhaul the $700 billion financial rescue package passed by Congress last fall. Investors shuttled between optimism and pessimism Wednesday, finally betting that the government might help the economy out of recession after all. News in late afternoon that key lawmakers agreed on a $789 billion economic stimulus plan sent stocks moderately higher. The advance, which came in a back-and-forth session, came a day after stocks plunged on worries about the government's financial industry bailout plan. The stimulus measure includes provisions for unemployment benefits, food stamps, health coverage and more. It also includes billions for states facing yawning budget gaps. Investors have been eager for any signals that the economy could begin to recover. Supporters hope the bill's mix of spending and tax cuts will increase consumer spending, which accounts for more than two-thirds of U.S. economic activity. Spending has stalled since the mid-September bankruptcy of Lehman Brothers Holdings Inc. froze credit markets and deepened the recession. Washington was again the driver behind the market's moves on Wednesday. A day earlier, investors showed frustration with what they saw as a lack of details from Treasury Secretary Timothy Geithner on how the government plans to direct trillions of dollars in public and private aid to support the ailing financial system. 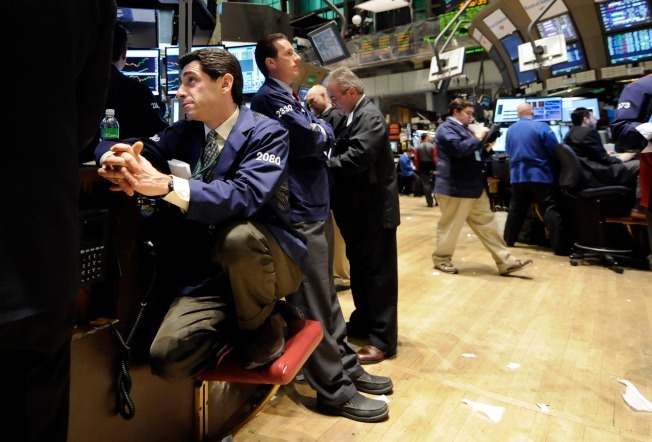 Major stock market indexes tumbled more than 4 percent. Chief executives of the nation's top banks appeared before a House committee Wednesday to answer questions about how they have put to use more than $160 billion in taxpayer money to date. The testimony and the stimulus agreement commanded the market's attention. Anthony Conroy, managing director and head trader for BNY ConvergEx Group, said investors are simply trying to keep ahead of the rush of news about the banking system and the economy. "I think everybody is trying to get through all this news. Without healthy financials it's very hard to have a healthy economy," he said. "Everybody has to digest all the tidbits of information that are coming out." According to preliminary calculations, the Dow Jones industrial average rose 50.65, or 0.64 percent, to 7,939.53. Broader stock indicators also rose. The Standard & Poor's 500 index rose 6.58, or 0.80 percent, to 833.74, and the Nasdaq composite index rose 5.77, or 0.38 percent, to 1,530.50. The Russell 2000 index of smaller companies rose 2.18, or 0.49 percent, to 447.95. Advancing issues outnumbered decliners by about 3 to 2 on the New York Stock Exchange, where volume came to a light 1.36 billion shares. The 50-point rise in the Dow following a 381-point drop the day earlier is "not a strong statement here," said Kim Caughey, equity research analyst at Fort Pitt Capital Group. "More information is what we need. What I mean by that is what exactly has been agreed to with the stimulus plan." And Wall Street remains nervous about how, exactly, Geithner's financial rescue plan will work out: how it will assess the banks, how it will price their bad assets, and how it will recreate a market for those assets. Investors "reacted to bad news yesterday. There wasn't more bad news today," Caughey said. "People didn't have a good sleep and say 'Whew, was I wrong yesterday.'" Bond prices were mixed. The yield on the benchmark 10-year Treasury note, which moves opposite its price, fell to 2.77 percent from 2.82 percent late Tuesday. The yield on the three-month T-bill, considered one of the safest investments, rose to 0.31 percent from 0.30 percent late Tuesday.